Washington state is considering converting some of its ferries to electrical power, and its Legislature recently voted to spend $600,000 to study the option. Alaska, on the other hand, is not. But officials here are considering a different alternative ferry fuel. Alaska’s nine working ferries all burn diesel, which is expensive. It also contributes to climate change, which melts sea ice and permafrost, damaging roads and communities. So it would make sense for the state ferry system to look for alternatives, such as electricity. “It’s not a new question. This question has come up in years past with the marine highway,” Capt. John Falvey, general manager of the Alaska Marine Highway System, said. Falvey said research showed it would be much harder to make electrical engines work in his fleet. Falvey said the most likely ship to be converted would be the Lituya. The small ferry sails a short route connecting Ketchikan and Metlakatla, in southern Southeast. He said electric engines also might work in Prince William Sound and northern Lynn Canal, which also have some short routes. The cost would be high at a time when the ferry system barely has enough money to keep its fleet sailing. Falvey said other challenges include the time needed to recharge batteries and the availability of cheap electricity at some ports. Falvey’s not writing off electrical conversions forever. Renewable Energy Alaska Project Executive Director Chris Rose believes electricity will be an option in the future. Alaska’s ferry system is planning for a different alternative fuel. Falvey said it’s liquefied natural gas. 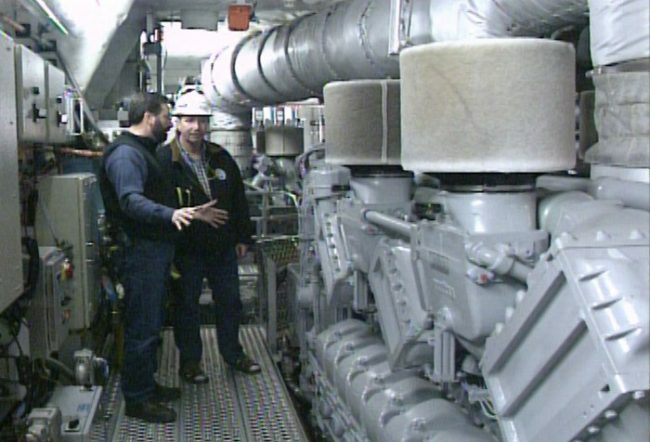 The marine highway is installing engines on two new Alaska-class ferries that will burn either diesel or natural gas. The small ships will link Juneau, Haines and Skagway. Falvey said it’s also installing dual-fuel engines on the larger ferry Matanuska. The same will happen when a replacement for the large Southwest ferry Tustumena is built. Falvey also said onboard storage could be tricky. Safety rules are very strict and have limited LNG use on passenger vessels. Those rules are evolving, he said. And cruise ships that run on natural gas are being built and put into service.